Frances Wood and Sharon Showalter at OnLocation co-authored a paper that was recently published in the Energy Modeling Forum (EMF) 32 special issue of the journal Energy Economics. The article, titled “U.S. Energy Sector Impacts of Technology Innovation, Fuel Price, and Electric Sector CO2 Policy: Results from the EMF 32 Model Intercomparison Study,” describes results from a joint study with the U.S. Department of Energy’s Office of Policy, the National Renewable Energy Laboratory, the Pacific Northwest National Laboratory – Joint Global Change Research Institute, and HEC Montréal. The study was performed using several energy models, including a customized version of the National Energy Modeling System created by OnLocation. 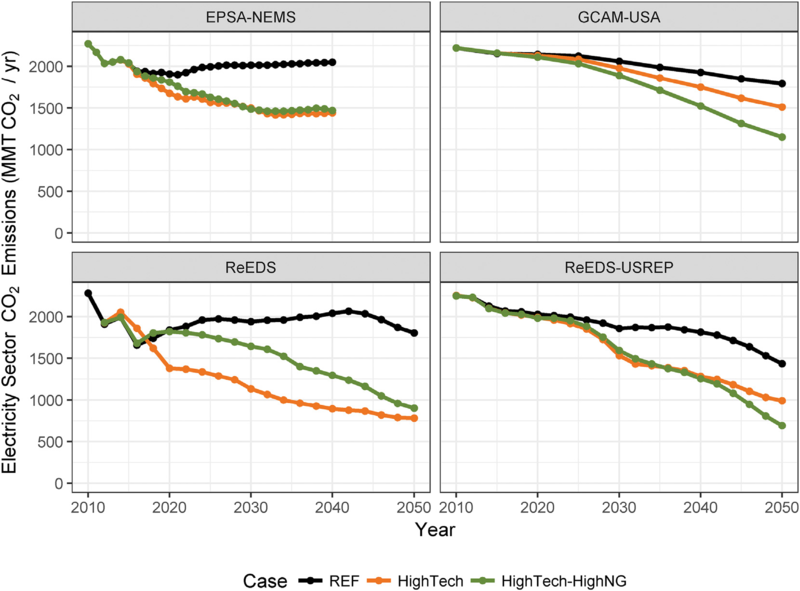 The impact of technology innovation, fuel prices, and a carbon dioxide (CO2) emissions reduction policy on the electric power and end-use sectors was analyzed by comparing results from four U.S. energy-economic models through the year 2050. The models included an economy-wide model (ReEDS-USREP), two partial equilibrium models with a full energy sector (EPSA-NEMS, GCAM-USA), and an electricity sector-only model (ReEDS). These models differ in multiple ways and provide unique perspectives on the potential impact of each factor of interest on CO2 emissions and energy supply and demand. How are technology choice, electricity price and CO2 emissions affected by natural gas price projections and technology innovation? How are the electricity sector emissions and fuel mix with technology innovation impacted by an electricity sector CO2 policy? How much do the answers to the previous questions depend on model architecture and assumptions? Eight different scenarios were run with each model to understand and answer the above questions. These scenarios combined high and low natural gas prices with high and low technology innovation, with and without a CO2 policy. To compare across models, output variables that were most relevant for analyzing the evolution of the energy sector in these scenarios were selected. These include: electricity generation, fossil fuel CO2 emissions by the power sector, wholesale power prices, and energy consumption by end-use sectors. Technology innovation has the potential to achieve CO2 reduction goals in the absence of a CO2 policy, regardless of the assumptions about natural gas prices. Technology innovation can achieve a generation mix with similar CO2 emissions as a CO2 policy but with a smaller impact on electricity prices. Higher natural gas prices are likely to increase the amount of renewable generation that becomes cost-effective to build and operate and also lead to fewer coal capacity retirements, especially when combined with improvement in technology. Technology innovation can lead to lower-cost energy efficiency technologies that will reduce energy demand and help meet CO2 reduction goals. To learn about how OnLocation can help you explore and model issues related to anticipated changes in energy policy, please visit http://www.onlocationinc.com/contact-us or contact us at contact@onlocationinc.com.